Collector, William Arnett was working on a history of African-American vernacular art in 1998 when he came across a photograph of Annie Mae Young's work-clothes quilt draped over a woodpile. He was so stunned by its originality of design, that he knew he had to find it and its creator. With a few phone calls and some creative research, he and his son Matt Arnett, tracked Young down to Gee's Bend, Alabama, where William Arnett then showed up (unannounced) at her door late one evening. Annie Mae had just burned some quilts the week before (smoke from burning cotton drives off mosquitoes), and at first she thought the quilt in the photograph had been among them. But the next day, after scouring closets and searching under beds, she found it and offered it to Arnett for free. Arnett, however, insisted on writing her a check for a few thousand dollars for that quilt and several others. Soon the word spread through Gee's Bend that there was a crazy white man in town paying good money for raggedy old quilts. And the 'raggedy old quilts' begin to miraculously appear from the walls, floors, beds, and rag bins of the most talented quilters that art historians had yet to discover! Lucy Mingo started working in the fields when she was 6, picking cotton, corn, peas and okra under the hot Alabama sun. She raised 10 children, fought for civil rights, crossed the Pettus Bridge in the march to Montgomery. Lucy has now made some 2,000 quilts in her lifetime and as part of the bigger collective of 50 African American quilt makers, known as the Quilters of Gee's Bend, her work, and many of theirs, has been exhibited in museums and galleries, and on postage stamps, since 2002. "My mother, my relatives had quilts in the first show," says Loretta Bennett, 48. "It was awesome to see their quilts on the wall and all the people looking. I was just so happy for them. It just brought tears to my eyes." To understand their accomplishments and how far they've come, you need to understand where they started and what they've endured. Gee's Bend is a sharp turn of a peninsula in the Alabama River. In tiny Gee's Bend, post-plantation life lingered longer than anywhere else in the South. Life remained hard for blacks in the South, but life stayed harsher longer for folks in Gee's Bend. It was as if the Great Depression landed there and took up permanent residence. Phones, lights and running water didn't even come to their homes until the 1970's. Quilts were made of 'shirt tails' and 'dress tails' and 'sleeve tails'. Those few remaining clean spots on old overalls, denim work pants, the backs knee area of house dresses and the tiny bits of fluff for stuffing left after hard days picking cotton, and hard nights cooking, cleaning, doing laundry the slow way, and raising children in small wooden shacks without benefit of running water or electricity. China Pettway, 57, also remembers those leaky roofs. "When it rained we had one good spot, one good corner to get in. All of us pile everything up there. Catch rain with buckets, pans and frying pans. "They all worked the fields as children, attending school only on rainy days. "We all missed school," says Loretta. "The teachers, they knew. We was all in the same boat." And Mary Ann Pettway, 52, added, "Mama was teaching us at home. She used a cardboard box and got a coal out of the fireplace and mark on the box to teach us our alphabet, to teach us how to read and write. But the one thing they seemed to almost instinctively know how to do.....was to make quilts to keep them, and their families warm. Their quilts were lined with gritty leftover lint from the cotton gin. When Lucy Mingo describes thrashing out the seeds and dirt "You beat it and beat it and beat it again. Then you beat it and beat it and beat it again. Hard work, but when we got done, those quilts was warm and they last a long time." As we heard in their lecture on Thursday evening, during the Sisters Quilter's Affaire Week..."You work in the fields in the day, quilt at night. A little print of cloth, get the bit, part it out, everybody using the same shape, nobody could buy nothing, nobody laugh at you, cuz they be in the same shape." And as they quilt, the women of Gee's Bend often sing soulful spiritual songs that meander around like the meandering lines of quilted stitches. They sang for us during their auditorium appearance, they sang during our Friday night picnic, and they sang as they signed autographs in front of the Stitchin' Post. Their original designs, too, wander around the realms of traditional quilting. Like the gospel music that surrounds and inspires them, their artwork is improvisational, unpredictable and deceptively simple. When others try to emulate them, they almost seem to overdo things in the attempting.... and just somehow miss the mark of these amazing quilts. The closest thing I've ever seen was the beautiful quilts showcased by Gwen Marston and Freddy Moran at our picnic lecture on Friday night. (more on those, later!) While incorporating their own unique collaborative style, their quilts felt like the quilts that had so inspired them from all of those years before. Today, Gee's Bend quilts and prints hang alongside the works of well-known artists, and fine art prints are made from some of their smaller quilts, but when asked whether they feel like artists, the women of Gee's Bend answer with a long, drawn-out "noooo." Gee’s Bender Quilter's have coined their own terms for common quilt patterns. They call the square-in-a-square Log Cabin pattern by the name "Housetop"; the Courthouse Steps variation is known locally as "Bricklayer." The Roman Stripes or Fence Rail pattern is, to them the "Crazy" quilt pattern. "What little we had, we took and use. We was loved. We share one another. We worked hard, we worked like slaves. We do chores, wash, cook, clean the yard, clean clothes, iron clothes, quilt 'til 2, 3 in the morning. We had to do it. It had to be it. I did what I could and made do with it." "But," admits Louisiana Bendolph, "when I go to our exhibits and see our quilts on the wall, I realize I'm part of something bigger. I'm learning how to use that word 'pride,' to know that some things I do are worthy of being proud." And when I told them how much it personally meant to me to meet them and to listen to them speak of their lives, and to see the immense and simple beauty of their quilts..they all answered with the same words. "People keep tellin' us that. I guess pretty soon I'm gonna believe it." And as they speak now, in lectures, at quilt shows, in exhibits in museums all over America, maybe, just maybe they're starting to believe it all right. With hearts and souls that stretch out beyond themselves, their spirits seem to soar...as they speak, as they sing, and as they quilt. And all I can add...is the words Florine Smith used to close the show...as she stared at each section of our huge audience..."Thank you, Thank you, and Thank you! And as they autograph their two volumes of quilt books on Saturday, July 11. All quotations taken from my direct notes during my own attendance at this lecture from the women's own words. No other article of any kind was used in the creation of this personal blog accounting of my own experience at this lecture. All photos are my own.... taken that evening, by me. Loretta Pettway Bennett created a Pine Burr Quilt for the State of Alabama while participating in the Alabama State council on the Arts Foklife apprenticeship grogram. 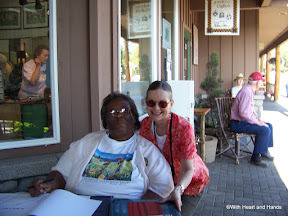 Loretta's mother, Quinnie Pettway, was one of the orginal Gee's Bend Quiltes and taught Loretta how to make it. On March 11, 1997 it was officially designated as the "State Quilt" of Alabama. Oh Michelle, I have tears in my eyes reading this. Those quilts...stunning, exquisite and awesome!! Their story, incredible. Thanks for sharing such wonderful ladies with all of us. How I wish I could see just one of their quilts in person and even more meet some of these precious ladies. You were so very fortunate to have done so. Than k you so much for sharing your experience to those of us that were unable to attend this years show. Sounds amazing. The energy and passion that has shone through in your recent posts is wonderful to feel from afar . . . shin splits, shin splints, go away ~ don't come back any other day (there's a song in there somewhere). Thanks, Michele - MARVELOUS sharing! Thank you for sharing this story I have so enjoyed reading and shedding a tear or two for these marvelous women. A truely remarkable life these women have had. wow, what an excellent write up. what a great lecture to attend, not to mention the quilts! What a wonderful write up of these wonderful women and their lives. The way you wrote this was like we were there with them, going back in time. Thank you so much for just inspiration. I was lucky enough to be there both Thursday night and Saturday for the quilt show. You did a wonderful job telling their story. Wow! Thank you so much Michele. These posts were so wonderful. I have goosebumps and tears. I've wanted to go to the Sisters show for years but this one would have been so fabulous. How lovely for these women. Did I read somewhere though that the man who paid them originally then sort of reaped a fortune by selling there images without paying them any further compensation? I think there was an article somewhere in the last year-maybe Quilter's Newsletter? Anyway, thanks so much for this special treat. They surely have influenced quilting in these last few years. You can't look at their quilts without thinking of artists like Nancy Crow and a bevy of others. Beautifully written and thank you so much for bringing it to those of us who couldn't be there. Thank you so much for sharing this, I am both moved and inspired. FYI Nancy Crow and other modern quilters have been designing and quilting for 30-40+ years ... I don't think the Gees Bend quilters have influenced their work. They weren't "discovered" until about 2000-2002.